1. First, we need to determine your maximum ISP upload speed so we can know how much video data can be transfered before running into issues such as buffering and freezing. Run the following test while using the internet from the streaming location. 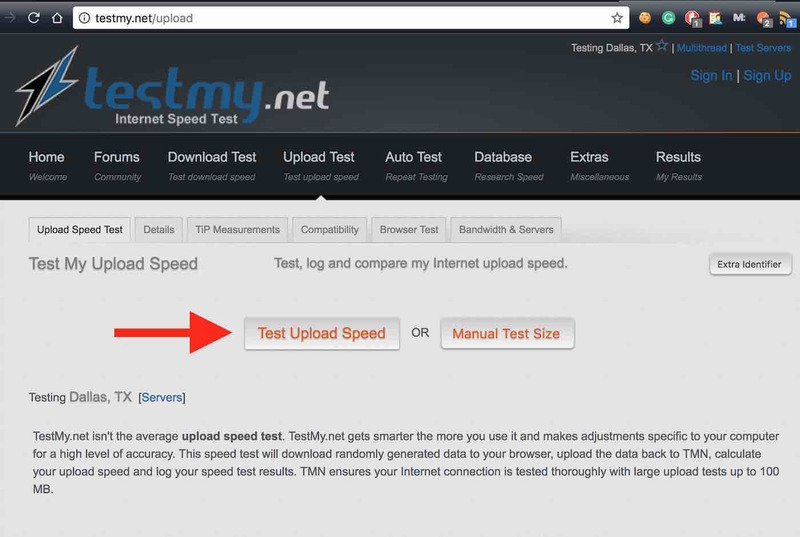 Visit www.testmy.net/upload and click the "Test Upload Speed" button as shown below. 2. After the test has completed you'll most likely be shown the results in "Mbps", or megabits per second. We'll need to convert this to "Kbps", or kilobits per second and then divide it in half. This will be the optimized bit rate for your video. Our optmized bit rate to live stream is 2550 Kbps. As per our example we had a result of 2550 kbps and we now have determined that our optimized resolution size would be 720p. 4. You can now update your encoder with the optimized video bit rate and resolution size and this will give you the best quality from the encoder end. It's good to note there are other factors that can degrade quality such as using non-digital connections or having non-hd cameras but using these settings will ensure your encoder is sending out an optimized video. ISP upload speeds do fluctuate from time to time. It's always a good idea to run a weekly speed test to make sure your speed hasn't changed much. This is especially important if you start experiencing issues with buffering/freezing as this will allow you to adjust you bitrate as needed during times of internet issues.